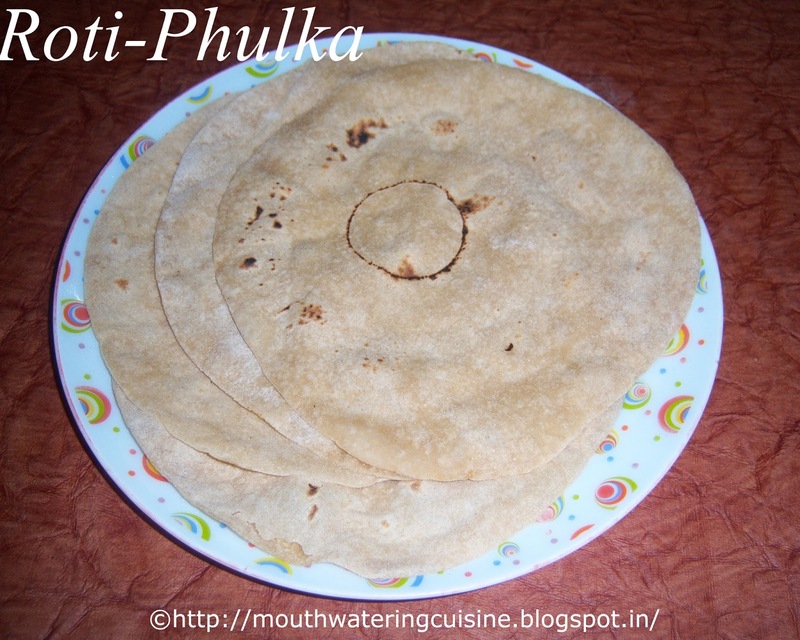 Roti or phulka is an Indian flat bread made with whole wheat flour. Practice makes a man perfect is an English idiom...this applies perfectly in the matter of roti making. As regular, we make roti as perfect and soft they come. So to get soft and puffed phulka we need to knead the dough as much as we can and allow it to rest for at least half an hour. Normally some people buy whole wheat and get it done in flour mills. But I prefer to use store bought 'Aashirvaad Atta', which is also a whole wheat atta and we get nice soft and puffy rotis with it also. For making rotis we need to have rolling pin and board. Tongs also required to take them from flame we get them in stores. Take required amount of whole wheat atta, for one roti take a fistful of it. Add salt and mix it. Slowly add water to it and mix it well. Once required amount of water is added knead it. Knead the dough with our fist and wrist base. Knead it for at least 15 to 20 mins. Sprinkle little water if required. The dough should not be too soft or too hard. Allow it to rest for half an hour, Cover it with a damp cloth. Make equal portions of dough. Roll it in palms and make round ball. Dust the rolling board and flatten one ball of dough and press it with rolling pin. Make it into 6 inches diameter circle. While pressing it do not over press and also take care all the edges also pressed properly. Then only the roti puffs. Make sure that the dough and rolling pin should move in circular motion. Roll till we get a flat and round circle. Heat iron skillet or non stick roti tawa. Put the roti on hot tawa, Allow this to cook i.e. form small bubbles on it. Flip it and again cook. Brown spots should be visible. Remove the tawa from the flame and using tongs take roti directly on flame. Slowly it puffs up. keep it like that till it puffs completely and turn it and again cook for a short while. Serve hot roti or phulka with any hot spicy curry. I served it palak paneer. If we have time to serve, after making them, spread a kitchen wrap or foil paper in the casserole and keep them in it. For kids serve them with butter or ghee on it.